We didn’t know what to expect, we’ve never been. 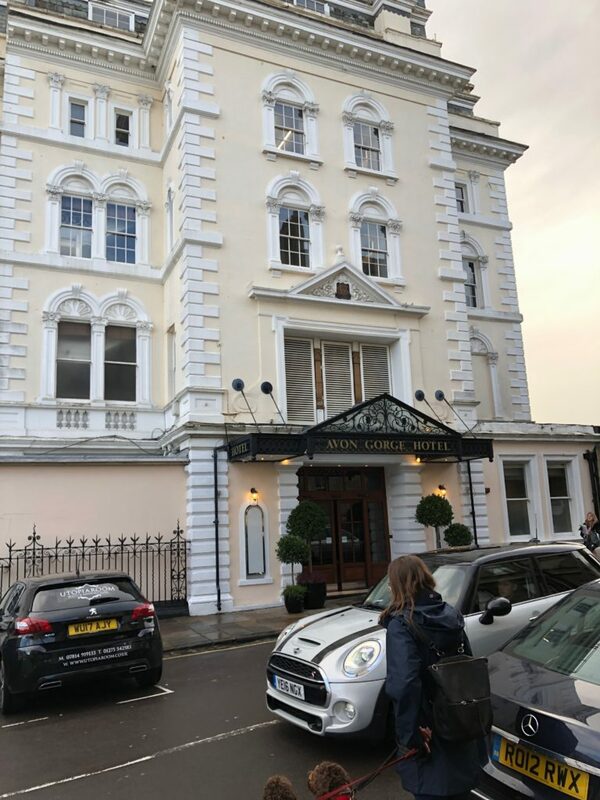 We arrived at the Avon Gorge Hotel late afternoon – which is part of the Hotel du Vin group – After checking in, we went upstairs to our room. 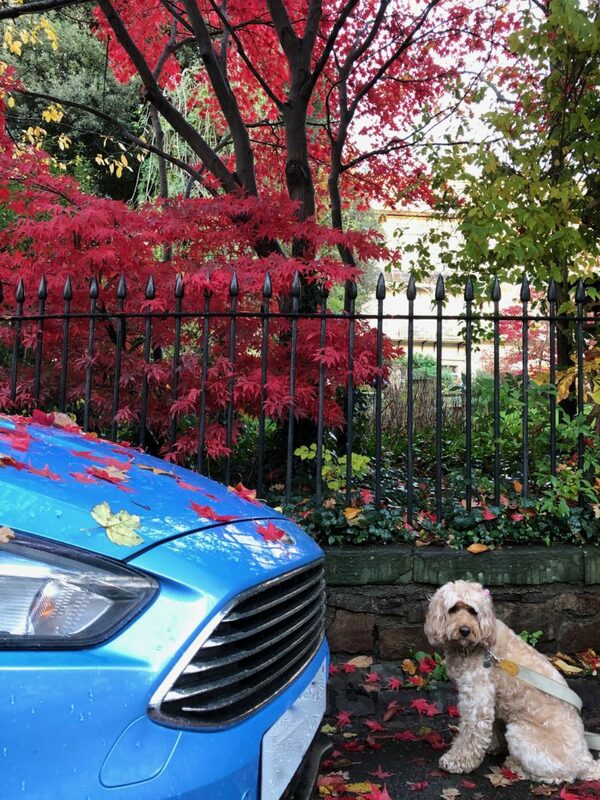 I think Mum liked the colour scheme – it looked very familiar! LOL! 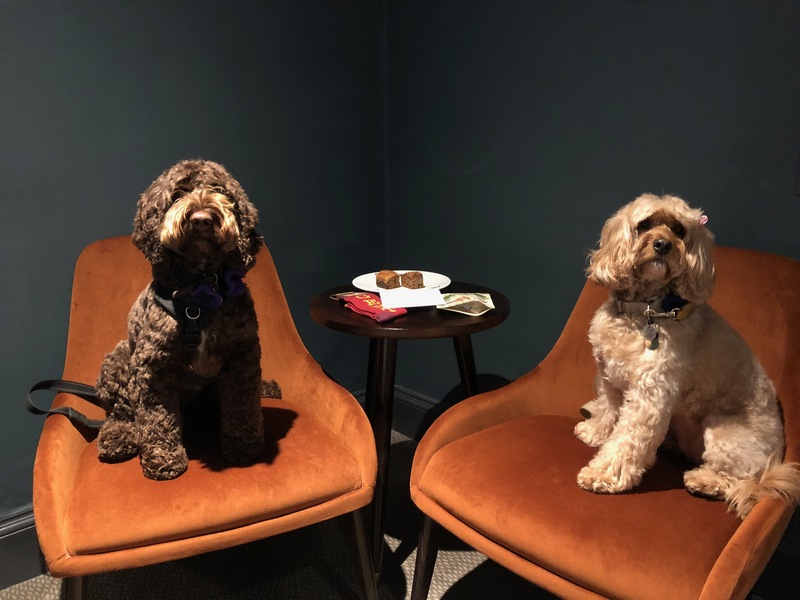 And look – there are welcoming pressies for hoomans and pooch! They had a bed for me and bowls. 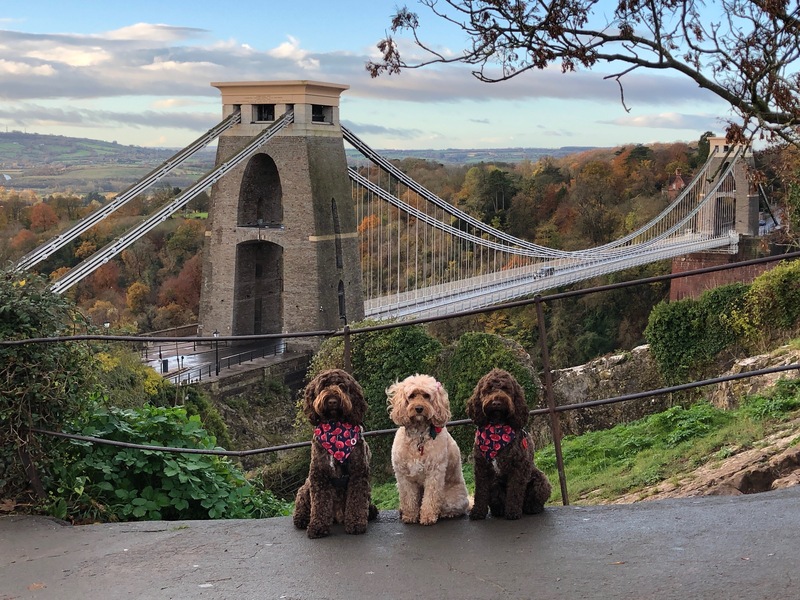 We met up with Coco, and she took us on a short walk up to the Observatory where we could get a good view of the suspension bridge. Well, I guess Coco is local and she would know all these places. 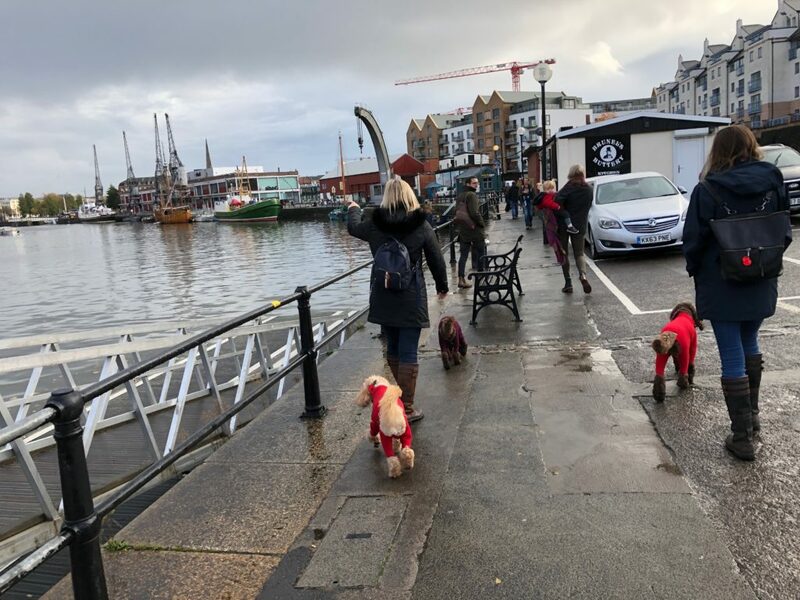 And so our adventure began … and when the weather did not cooperate on Saturday morning, we went into plan B – as in Plan Banksy! Mum was excited to see two of them, but as one was inside M Shed Museum, meant I saw only one. 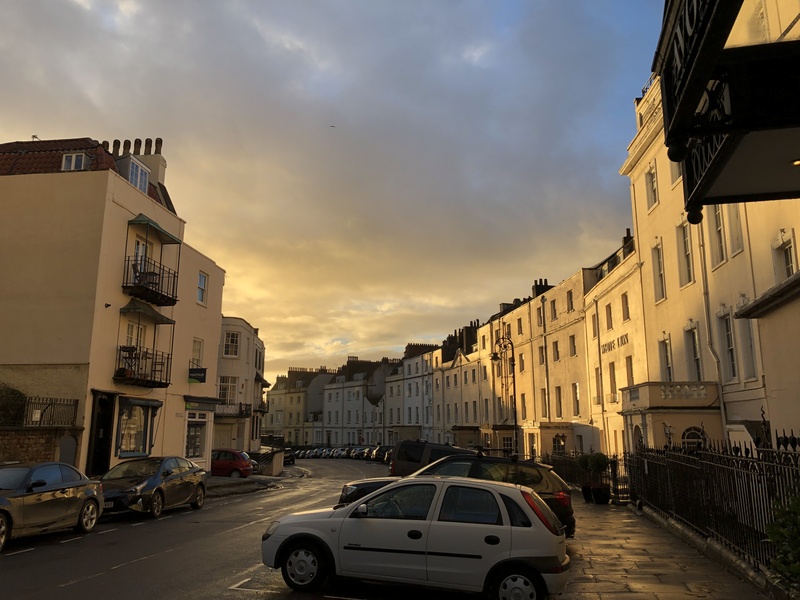 There are a few others that are outdoors but we didn’t have the time – so it means we will have to do a return trip someday to do more of Plan B. We walked freely off leash along Princes Wharf and into the squares. Can you imagine doing this with George?!?!?!? 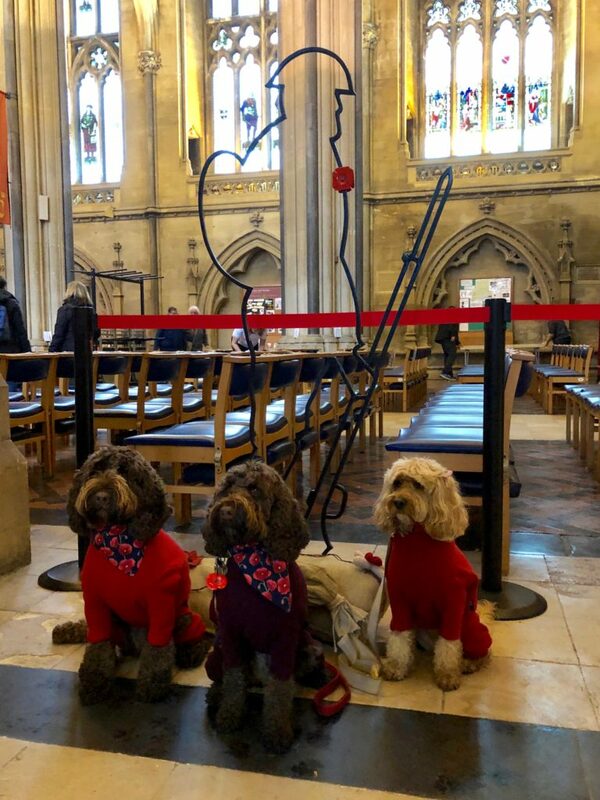 We were even allowed into the Bristol Cathedral – though dogs should be carried, we were allowed to walk – maybe because we were wearing red Equafleeces. They thought we were dressed like poppies! 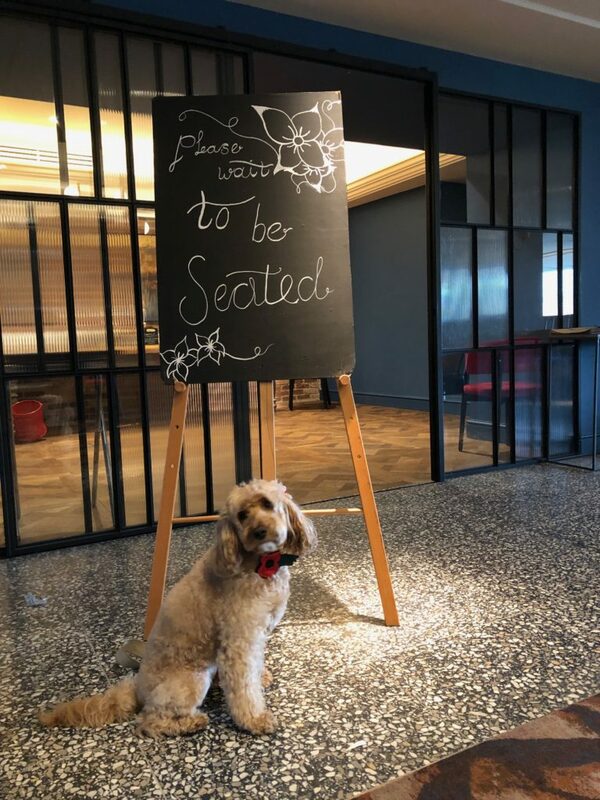 Thanks to Coco’s mum and dad, they showed us several dog-friendly places to eat. 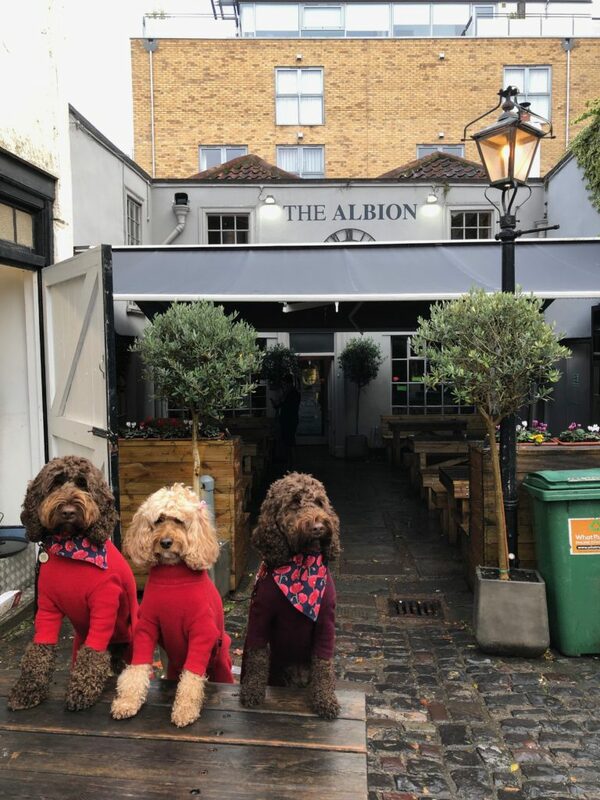 We had lunch at The Albion, a 17th-century village pub setting with a cobbled enclosed courtyard. For the first evening, we went to Rosa Tapas. 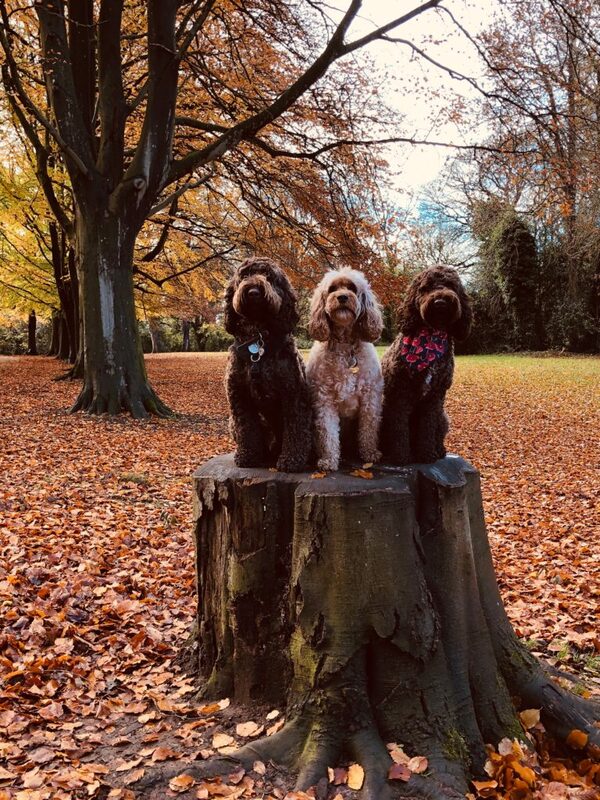 From what we could hear the hoomans saying, they thought it was simply divine. We had the upstairs private dining room because there were a group of us, but otherwise, we were allowed downstairs. 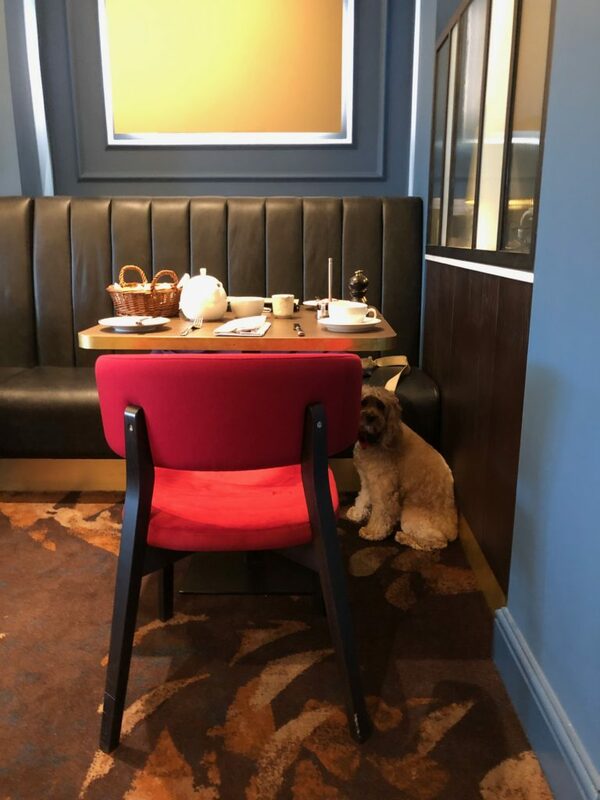 So it seems it was a big hit – very dog-friendly and very good food. The next evening, we had dinner at Wellbourne. – a nearby restaurant in Clifton Village. Once again, very dog-friendly. It is a small neighbourhood restaurant, with a Scandi decor and excellent food. 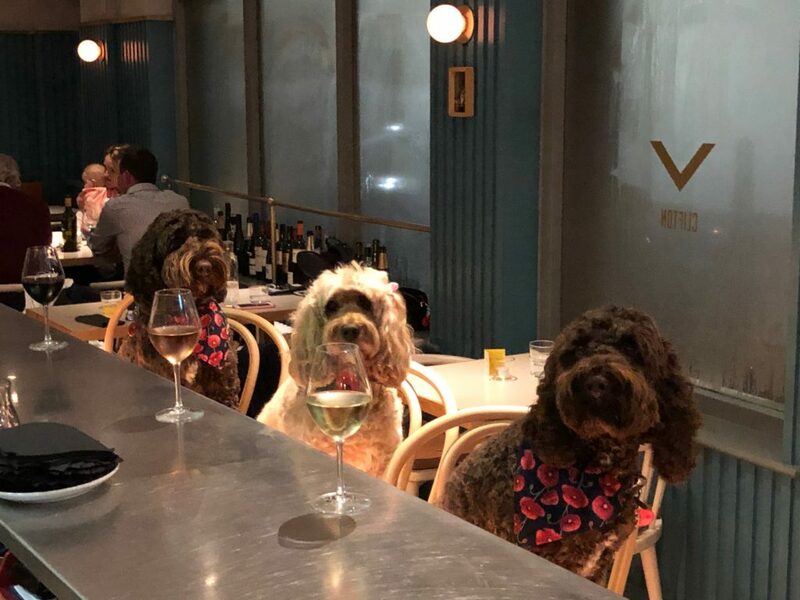 They were such good sports – to allow us to sit at the bar and even offered us drinks. LOL! 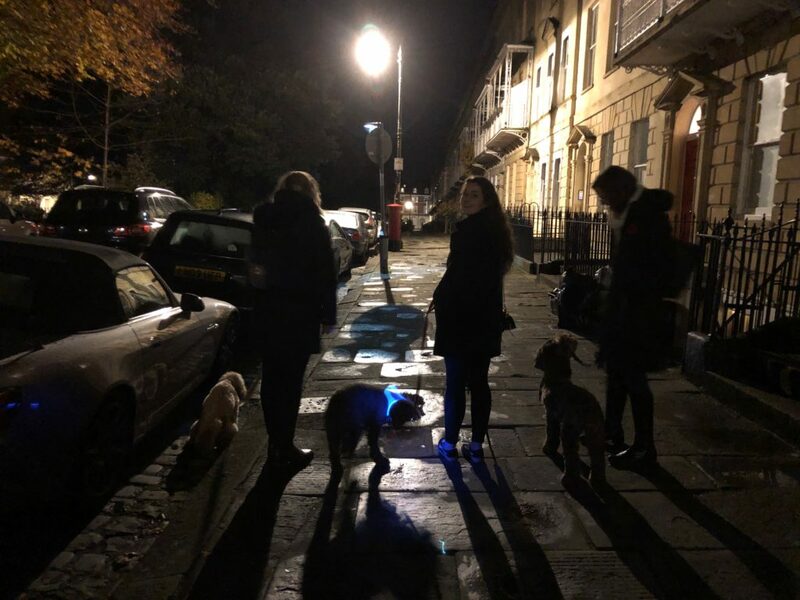 We walked home after that through a lovely square When we went out for our last walk before bedtime, we saw the Suspension Bridge all lit up. We could also see the bridge from our window. 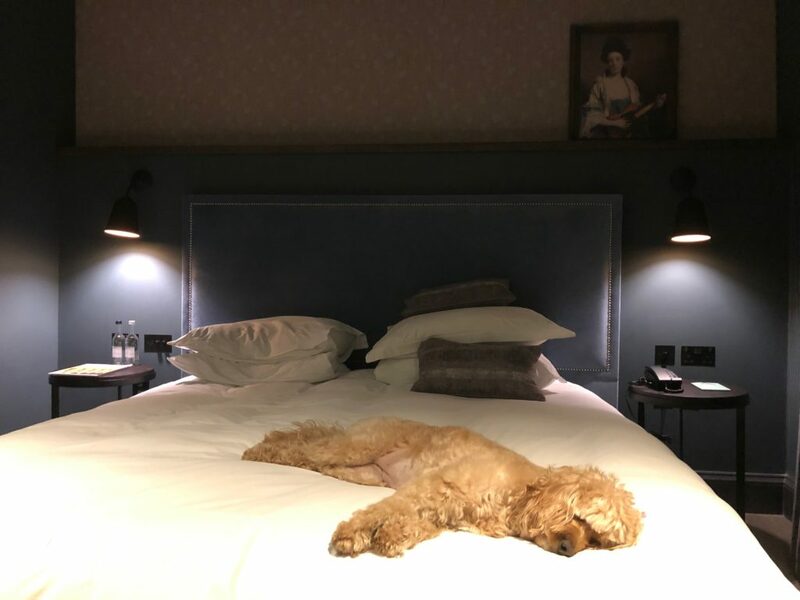 It was a long day, and I soon fell asleep while Mum continued to write my blog. 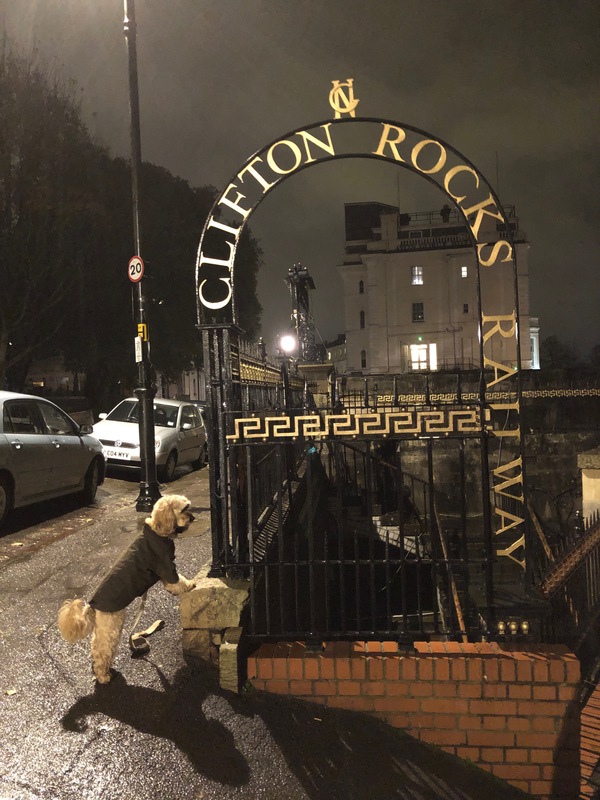 Well, I think we’ve enjoyed our stay in Bristol, more like Clifton actually. This was taken as we were walking back to the hotel. 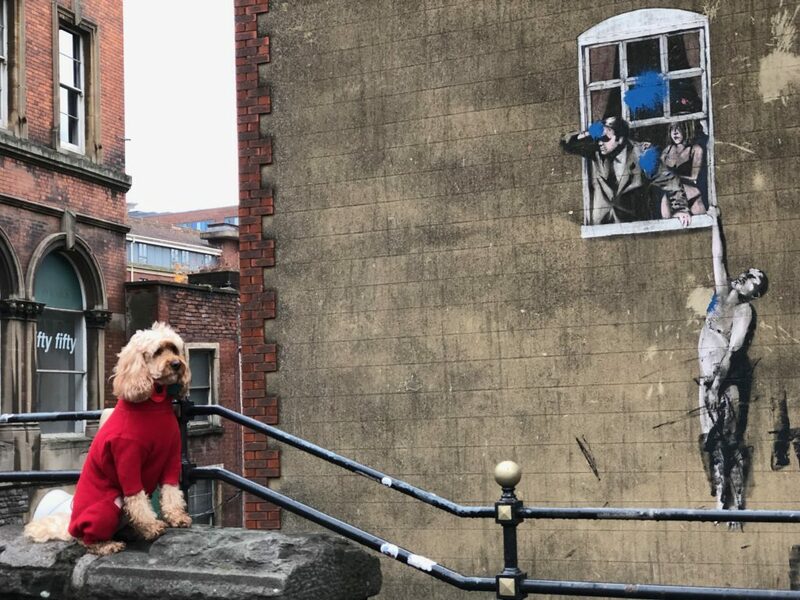 Think there’s talk of a return trip some day – still a few more Banksy to find, and more dog-friendly restaurants to try out! But I think we’ve found the perfect hotel for us. 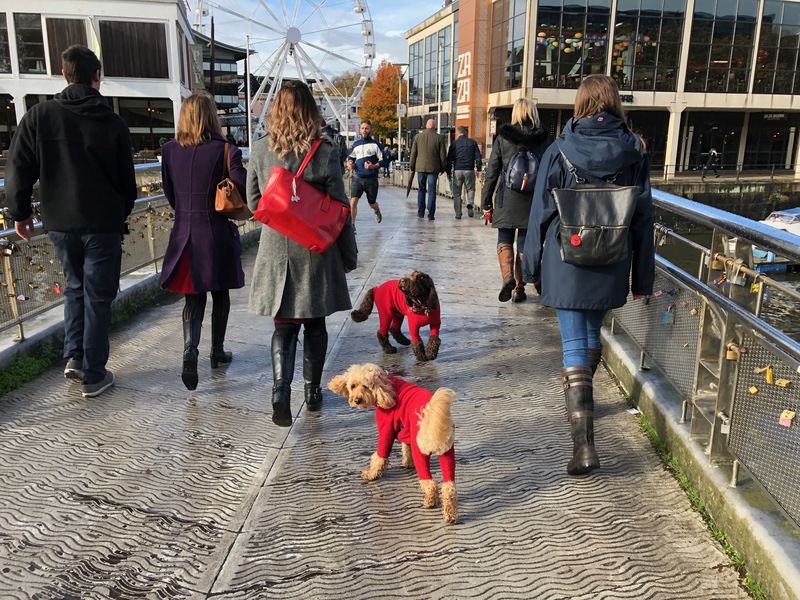 We had problems finding taxis taking dogs, so thankfully Coco and mum, Loesje kindly showed us around all these lovely places – including our last walk along The Promenade – It looks like Fall is here! 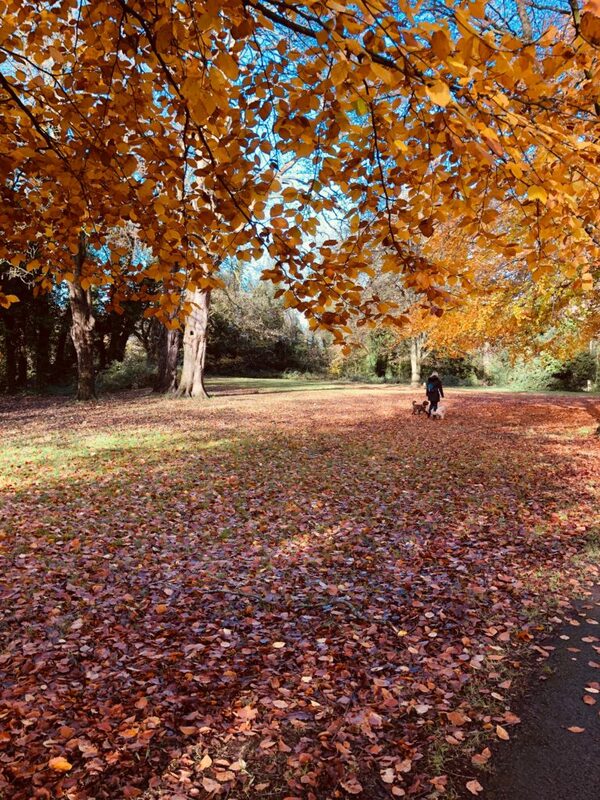 It was just very pretty looking at the Autumnal colours. 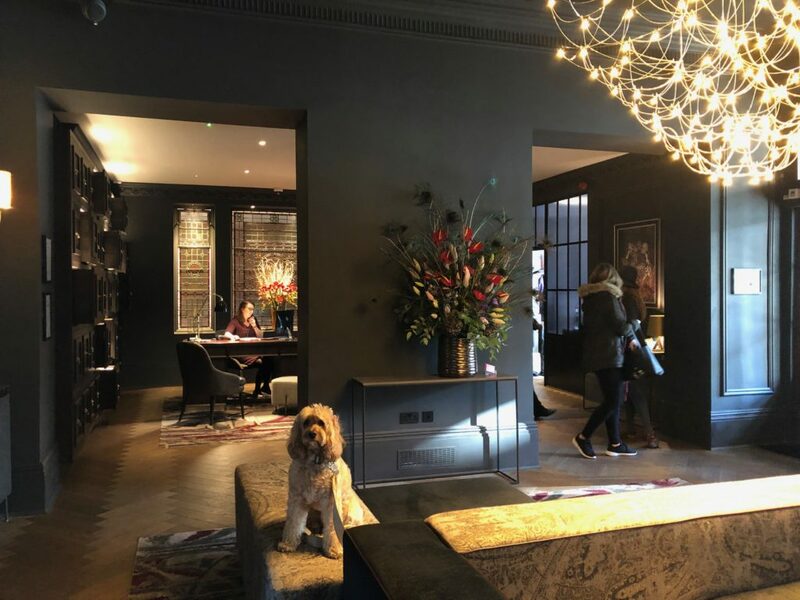 Like a painting … May’s comment: Whenever there’s a Hotel du Vin in any of the places we visit, we tend to just go with them as they are dog-friendly though they vary in levels of dog acceptance/tolerance. 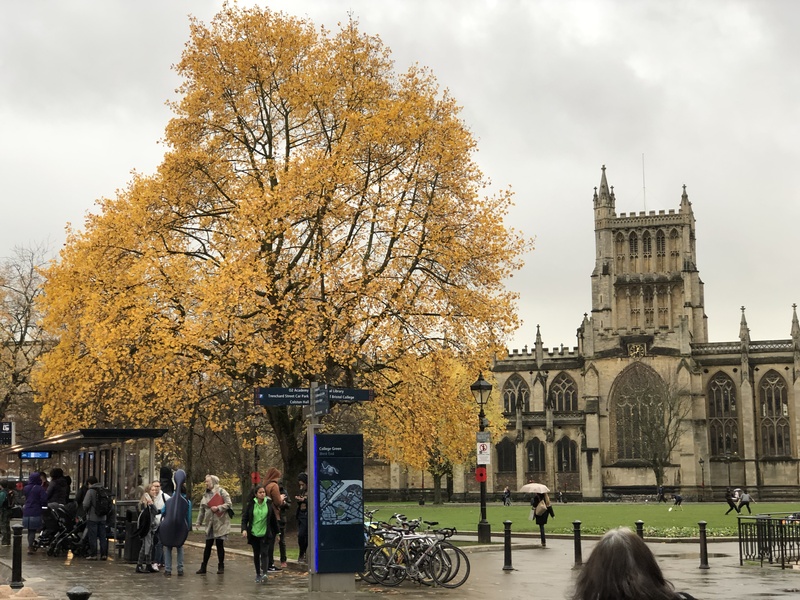 In Bristol, they have two properties – one in the City Centre and the other in Clifton, the Avon Gorge by Hotel du Vin. 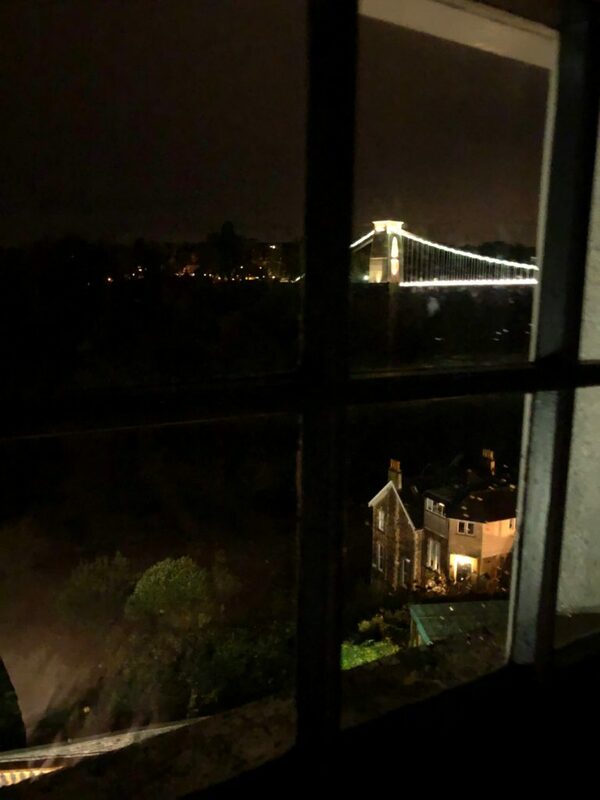 We chose to stay at the Avon Gorge for location. There are lots of lovely walks nearby, not to mention views of the suspension bridge. 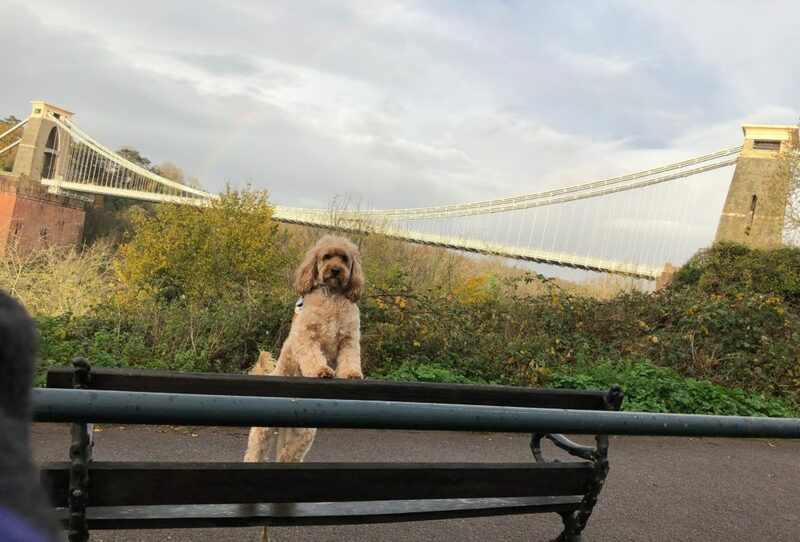 Across the bridge is Ashton Court – proposed for dog meets! 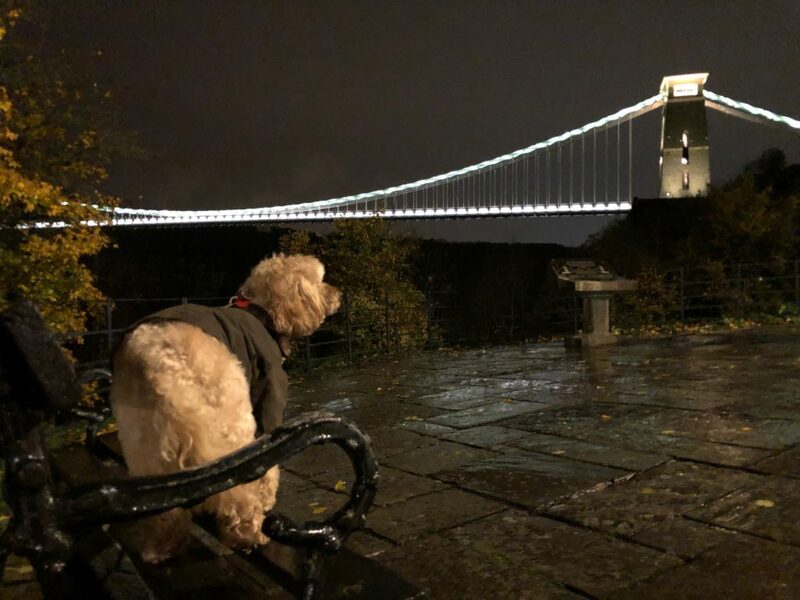 At Avon Gorge, dogs are allowed in the separate area in the restaurant. We had breakfast there. 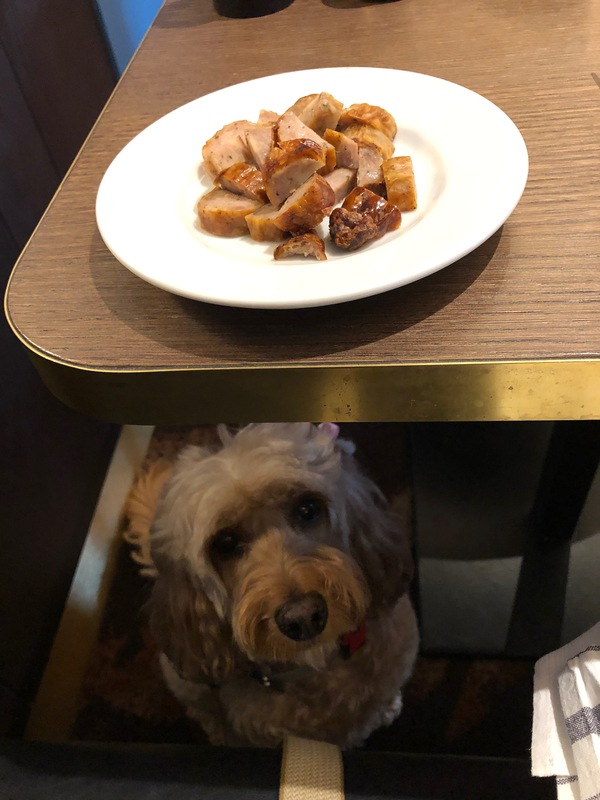 And they even offered sausages for Darcy! 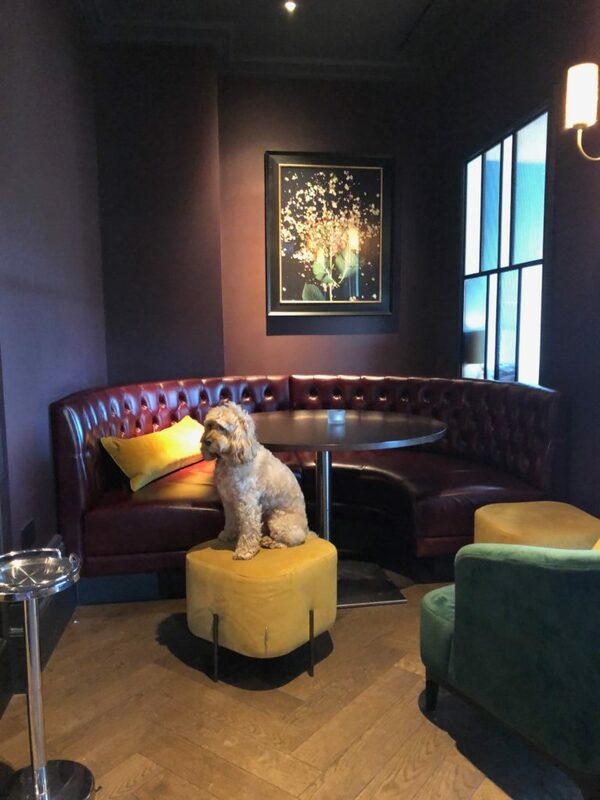 There’s also a lobby lounge where drinks can be served – which is also dog-friendly. The lounge also has an outdoor patio with lovely views of the gorge and the bridge. 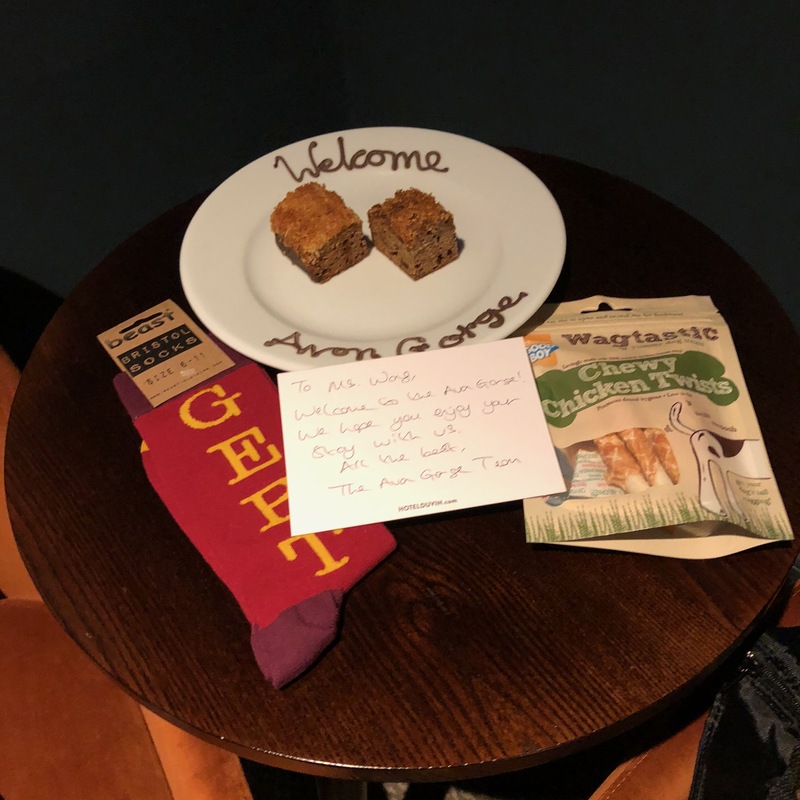 They supplied a dog bed and dog bowls with a packet of treats. 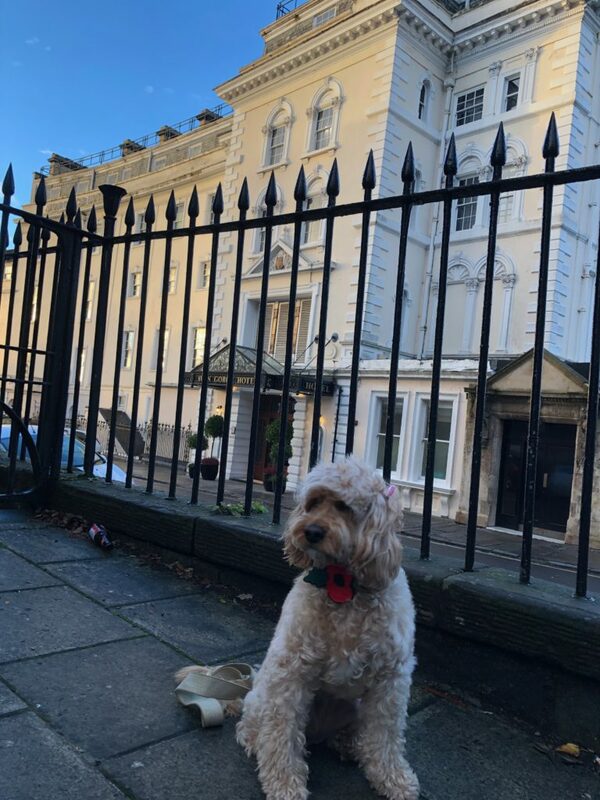 Thanks to friends who live locally, we went to some lovely places that are very dog-friendly. These are just three – have heard there are a few more around – for the next time! What a treat it was to be driven to Bristol. For a change – no train schedules! 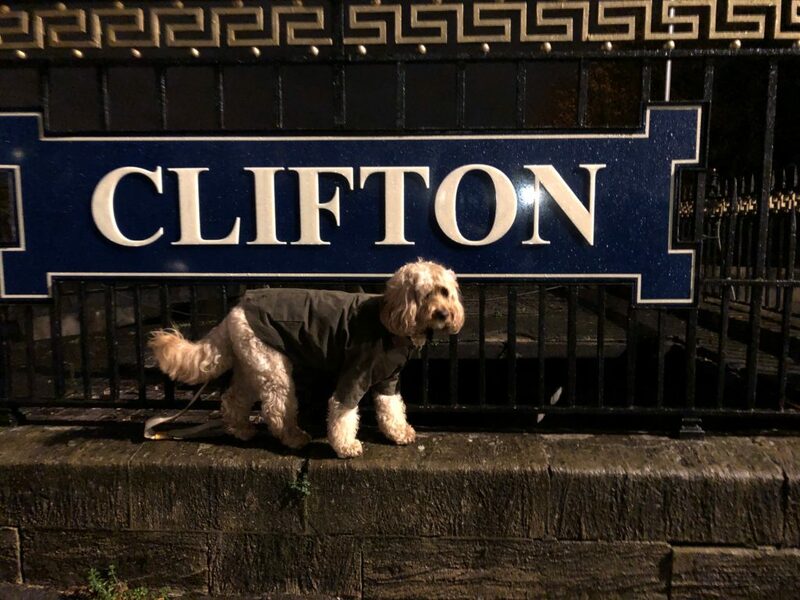 And thank you to Rob, Loesje and Coco for making sure we ate well and saw all the lovely sights in Clifton. May, how do you keep the dogs’ frozen raw food frozen when you go away? For two days it’s doable. I keep whatever I took as frozen in the room fridge. Or outside when it is really cold!